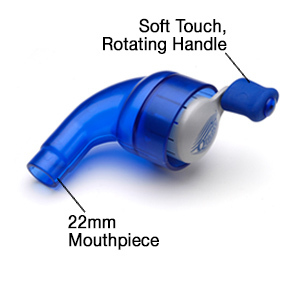 Thayer’s Quake® airway clearance device is a device that oscillates a column of air in both the inspiratory and expiratory phases of respiration. The innovative design consists of a manually turned outer-barrel rotating around the inner barrel of the device. 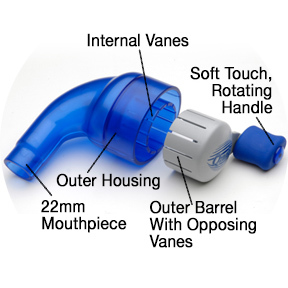 Airflow occurs only when vanes within the two barrels line up, and is interrupted at regular intervals as the user turns the handle. 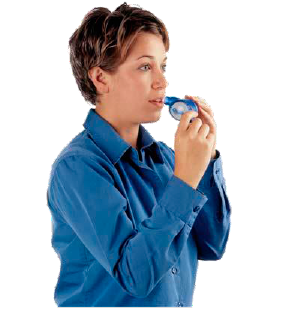 Percussion is achieved as small bursts of air are inhaled and exhaled through the vanes. The rate at which the handle is rotated will determine the frequency of the flow interruption. The oscillation frequency and pressure differentials are dependent on the speed of the handle rotation and patient effort. This allows the patient to find the combination that is most suitable for their needs.